Another win when it comes to Entangled Crush. 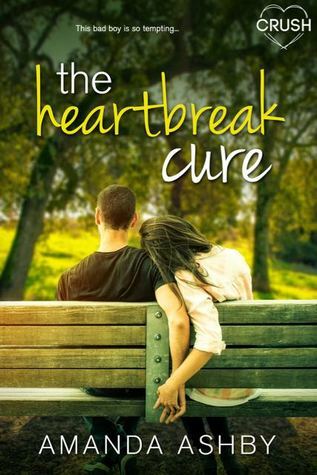 While The Heartbreak Cure was just as cute and sweet as most of the YA romances published by Entangled Crush, it stood out to me because it did a great job building relationships that made me feel aside from the romance. Using a mix of friends to lovers + fake relationship + bad boy tropes, the romance was swoony from start to finish, especially because I learned early on Alex had a thing for Cat. I'm all for the "boy secretly likes girl" thing, and it worked really well here. But, yeah, like I said, I'd come to expect adorable romance arcs from this publisher, and while I'm super happy this wasn't an exception, I'm also glad we also got to see good family and frienship bonds. The relationships between Cat and her mother and Cat and her best friend brought a much needed lighteness to the story, which balanced well Alex's much heavier side. Cat's mom was pretty awesome, and I truly enjoyed seeing those two being respecteful and having a healthy mother-daughter relationship. As to Cat and her best friend, there was no unecessary drama or girl hate, which YAY!!!! Those two seemed to really enjoy each other's company, and I loved how her friend was the sassy one while Cat was a little shy and more reserved. While Cat's arc was more focused on the romance and her passion for writing, I thought Alex had the biggest and heavier arc. Poor guy had a dark past that dragged him down and made me feel like he was unworthy of love, which broke my heart. Alex was a great guy: honest, hard-working, respectful, so he deserved to let go of those ghosts and be happy. I loved how he got to that happy point by noticing that he wasn't alone (and in truth hadn't been for a while). His relationship with his boss, his grandmother and with Cat were huge influnces and helped him underestand that there were more than enough people in his life that believed in him and saw the good in him. The Heartbeat Cure was a little heavier on the internal and emotional arc side of things, but it was still a cute and fun read.